Longtime skater, designer and ATL native Greg Mike has lent his hand to a new Real capsule drop releasing this week worldwide in skateboard shops. The REAL x GM capsule contains a one of a kind 3-foot tall hand-painted sculpture being auctioned off with 100-percent of the proceeds going to the JohnnyKicksCancer Foundation. Also being released are REAL x GM Ramondetta and Brock pro decks, two team decks and a custom shaped can cruiser. Custom sticker packs and a T-shirt will also be released. 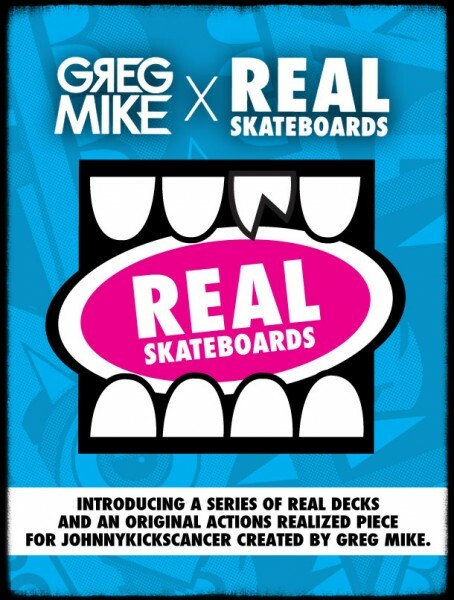 Check out the new video with Peter Ramondetta in Greg Mike Vs. Real Skateboards, and the making of the Greg Mike Actions REALized can sculpture for JohnnyKicksCancer.